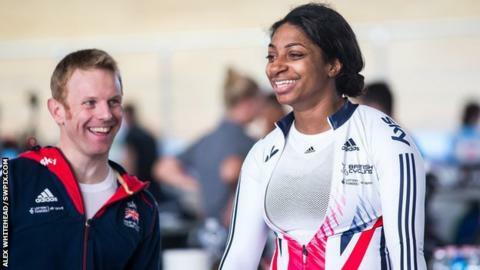 Kadeena Cox overcame a reclassification to win gold for Great Britain at the UCI Para-cycling Track Worlds in Italy. Cox, who is also a world champion sprinter, was due to ride in the C2 event but was moved to the C4 category to race against less-disabled riders. A British Cycling appeal failed but Cox set a new C4 world record of 37.456 seconds to win her 500m time trial. "We knew I had potential but I'm happy to have come out and performed," she told BBC Sport. There was also gold on the opening day of the competition for Megan Giglia in the C3 3km pursuit - her first world title - while Jody Cundy successfully retained his C4 kilo title - the ninth time he has won his kilo event. Dame Sarah Storey beat team-mate Crystal Lane to silver in the C5 500m time trial while Jon-Allan Butterworth returned after a break from the sport with silver in the C5 kilo. Cox, 25, who is aiming to compete in both athletics and cycling at the Rio Paralympics, suffered a stroke in May 2014 which led to Multiple Sclerosis. She is hoping to be the first GB athlete since Isabel Barr (later Newstead), who was successful in shooting and athletics in Seoul in 1988, to win medals in two sports at one Games. She smashed her previous best time of 39.153 seconds with 37.456secs to beat China's Jianping Ruan's mark of 37.879secs set two years ago. "It shows I have the potential to go out and do both sports," the Leeds rider added. "I'm happy with the win and the world record but it is frustrating knowing I made a few mistakes and it could have been quicker." Cundy maintained his dominance in his event, despite struggling with an elbow injury in the build-up. "I'm over the moon because up to three weeks ago I hadn't done a standing start," he said. "To overcome that and show I am still one step ahead of my rivals is fantastic. "Considering the year I have had and the injury it is nice to know I haven't lost it and it gives me a good feeling ahead of Rio but I have plenty of hard work to go."